The wind park project has enabled us to produce all our electricity needs and become a net exporter to the grid. The Community operated a Wind Park division, incorporating a 75kW windmill, from 1989 to 2006. It traded successfully and this turbine generated nearly 1.5M units of electricity, and saved 2,000 tons of CO2 emissions. 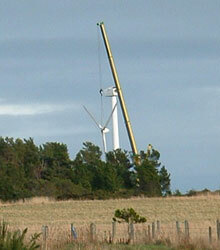 The next stage for this project was the 2002 creation of a new company called Findhorn Wind Park Ltd. This raised £600,000 and erected three additional turbines, and the project now has a total installed capacity of 675kW. These new turbines came into operation in March 2006 and were a major step toward self-sufficiency in renewable energy for the Ecovillage. Ekopia’s investments in Findhorn Wind Park Ltd. are in the form of voting shares in the company and loans. The Ekopia Board of Directors has identified the Wind Park project as a Medium-high risk investment with the risk likely to reduce over time. 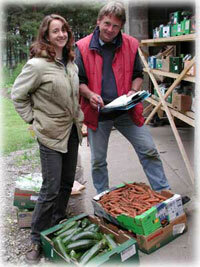 New Findhorn Direction Ltd. is the Findhorn Foundation’s wholly-owned trading company. 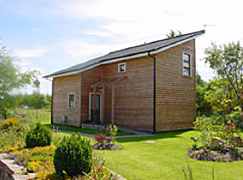 In 2003 Ekopia lent this company over £100,000 to support a new visitor eco-chalet project. The Findhorn Foundation is an educational charity which we provide support to from time to time. Both these investments have been identified as a Medium Low risk by the Ekopia Board. The Community Buy-out of Phoenix Community Stores Ltd. was completed on 31.8.01. Offering a wide range of whole foods, books, music and crafts the Phoenix has a turnover in excess of £1,000,000 per annum. In 2016 the business became a ‘community interest company’ and is now known as Phoenix Findhorn CIC. Ekopia members investing a minimum of £500 for five years in this project will receive a discount for purchases made there, and 5% interest depending on the Phoenix’ trading performance. We have so far raised £162,926 for re-investment in the Phoenix. Ekopia owns 47% of the voting shares in Phoenix Community Stores Ltd. and is the largest shareholder in the company. The remaining voting shares are held by other stakeholders including the directors and NFD Ltd. These shares are classified as medium-high risk by the Ekopia board. After a number of difficult years there has been a significant improvement in trading conditions and a part- payment of interest was paid on investments in 2016 and we anticipate a full payment in 2017 and beyond. We are currently exploring the possibility of a new shop building with our other stakeholders in the project. 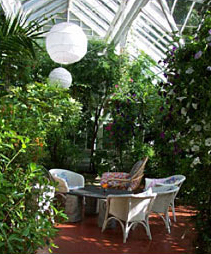 This charitable trust is located in a beautiful Victorian mansion, close to the town of Forres. Since its birth in 1893 it had been a family home and a hotel; in 1982 Newbold became the host for a small community dedicated to personal growth and transformation. This investment has also been identified as Medium Low risk by the Ekopia Board. Low Risk: Investments in authorised bodies e.g. banks. Medium Low: Organisations with a good business plan, a trading history showing ability to cover twice the interest costs, and collateral to offer. Medium High: Organisations with a trading history showing an ability to generate profits, but not meeting all of the low medium criteria. High Risk: New enterprises with no profitable trading history and enterprises where we have identified other high risk issues.